Are You Reading Aloud With Your Child or Do They Read On Their Own? Reading is an essential skill to have. It allows people to learn, it gives them access to information and ideas, it allows them to communicate with others and become an active and productive part of their living community. So how do you go about teaching your child to read at their full potential? One of the best things you can do is read aloud with them. Reading to children, or having them read aloud along with you, can yield a great many benefits when it comes to reading, vocabulary, and comprehension. Reading to your child is often their first experience with reading itself. It is important that children develop relationships with books early on. This can be accomplished with books read to children as well as allowing children to play with baby books, typically of the plastic or thick cardboard variety that allows kids to chomp and play with them physically. While kids grow comfortable with books as objects from the standpoint of a plaything, reading to children will help familiarize them with the action. It will also help boost vocabulary and communication skills as well. As children get older, reading aloud to them remains important. Reading out loud can help boost their reading comprehension skills on several levels. “Children learn when they make connections between what they hear and what they know. One method parents can use to help make these connections is called a think aloud, where you talk through your thoughts as you read (Gold, Gibson – Reading Rockets).” This method utilizes their imagination in order to visualize the story being told. If your child is reading along with you, they can begin to familiarize words by sight with their sound, making them much more effective readers. 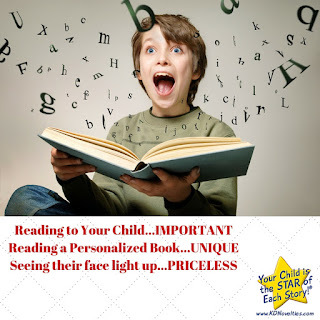 Books personalized for children can boost the read aloud, think aloud, method. As you verbalize thoughts when reading, children can associate with the story as they become the stars of the storyline. These types of customized books can be especially helpful with reluctant readers or struggling readers as well. Having your child read aloud to you can be helpful for them, too. 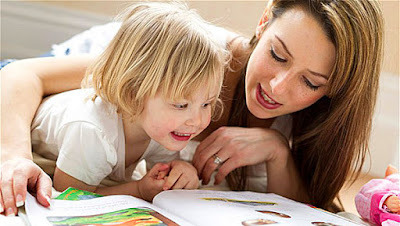 You can hear where their strengths are and where they may be having trouble, but having your child read aloud to you on their own can help build their confidence, find their own voice, and learn how to build their own vocabulary, enunciation and other basic communication aspects as well. Above all, as beneficial as reading aloud can be, it ultimately provides you and your child with ample quality time that you will cherish for years to come. Setting aside time for reading with your child will help build your relationship and can allow you to share interests, stories and imaginative ideas.